The subtitle to this book – How Humanity Will Survive A Mass Extinction – should tell you all you need to know about the content. I’m a huge fan of post-apocalyptic fiction, in part because of the utter inevitability of its subject matter. No matter what we do, disaster looms on the horizon and the only decision left in our hands is how we handle the aftermath. The hands of the clock keep ticking, sweeping ever closer to midnight and we need to get our collective thinking caps on. Newitz illustrates the urgency of the situation by taking us on a guided tour of mass extinctions, analysing the events and survivors to piece together some kind of contingency plan for our entire race. 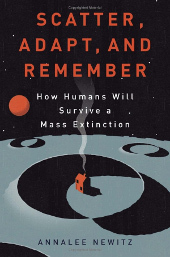 Scatter, Adapt and Remember starts off in the deep past, looking at what we can learn from previous mass extinction events in our planet’s history. It’s somewhat ironic, given our current dire climatic straits, that the first great extinction was caused by a relatively new lifeform poisoning the atmosphere and causing massive temperature changes. Yes, the humble cyanobacteria – ocean-going algae – is one of earth’s greatest mass-murderers. Some billions of years ago our atmosphere was extremely unfriendly towards modern life. Baking temperatures and masses of CO2 were the order of the day, until cyanobacteria arose and began absorbing the carbon dioxide and releasing unprecedented levels of oxygen in its stead. Good news for us, right? Well, we are a little biased. The falling CO2 ratio freed Earth from its greenhouse state and temperatures plummeted. The overwhelming majority of organisms alive at the time were simply not equipped to deal with the cold or the newly poisoned atmosphere and simply vanished, the slate wiped clean. In their place sprang up the predecessors of the rich biosphere we currently inhabit. From these humble beginnings we go through the Great Dying, the asteroid which killed of the dinosaurs (or did it?) and other similarly catastrophic events. Newitz does a sterling job of picking through the minutiae of each incident and throwing the spotlight on the salient features which provide the clues vital to our own survival. Now that we’re up and running we get to the ‘scatter’ part of Scatter, Adapt and Remember. Starting with a recounting of the Jewish diaspora – which the author thankfully points out is merely an allegory, with no historical evidence for the Biblical version – we’re given a guide to the importance of spreading out. Eggs in many baskets and all that. Taking in both historical and genetic sources, Newitz describes just how humanity and other species have successfully colonised large and diverse environments, and why failure to do likewise has spelled doom for many others, including our cousins the Neanderthals. Of course, in the case of a global disaster we’re not talking about seeking out new nooks and crannies on Earth. No, we must look further afield for our eventual survival, to our neighbouring planets and even star systems. That’s where ‘adapt’ comes in. We’ve done well for ourselves in the varying terrestrial niches we inhabit but space is a hostile environment. Massive distances and cosmic rays are but two of the dangers we will face, and beyond that there is the issue of the planets we’ll eventually encounter. The human frame is incredibly fragile and would need massive modification in order to pull through. Or would we even take the ultimate step and say farewell to the flesh altogether? These are among the very real possibilities discussed in the book’s closing chapters. During the course of reading Scatter, Adapt and Remember I was forced to field the same question several times: “Why are you reading something so depressing?” Well the answer is this – Scatter, Adapt and Remember is among the most positive books I have ever read. It’s not about how we might survive, it’s about how we will survive. At it’s heart is a call for humanity to fearlessly tackle the most daunting of problems and create our own future. There’s nothing grim between these pages, no shambling survivors turning to cannibalism in the wreckage of society. This is a vision of our species moving ever onwards. On a closing note, I’d say that one of the marks of a great non-fiction book is that on finishing your reading list has not decreased by one but increased by several. This is certainly the case here. Newtiz provides copious notes and references, opening up avenues into all aspects of her study for interested readers. For that I am eternally grateful, even if my new list of must-read titles will now keep me busy right up to our eventual cataclysm.